Jim tells Todd that Beverly left their anniversary dinner early to go to a patient call. Beverly gets back to the restaurant to find Jim has gone. Josh and Todd make plans to go to the cinema tomorrow night as Jim sits down on the sofa with a newspaper. Beverly storms into the house and rather unreasonably rants at Jim for leaving the restaurant. BEVERLY:(angrily) What the hell was that about?! As Beverly continues to rant, Jim gets angry too, and shouts that he doesn't appreciate spending $80 on a meal he hardly touched - he waited an hour and half for her! Beverly shouts back that it was an emergency and she had to go to the hospital in the ambulance with a heart- attack victim. Jim says there are other doctors and Beverly tells Jim off for not understanding. Helen is telling Paul that Beverly and Jim were both asleep when she got back from the art gallery last night, but she thinking they must have had a wonderful time(!) They chat about anniversaries and Helen realises that it was also Paul and Gail's anniversary yesterday. It must have been hard for Paul. He says he just did a load of work and it wasn't a big deal for him. Helen asks Melanie to file some stuff for her. Paul asks Melanie for a report but she says they've only just faxed through the figures. He snaps at her to hurry up. 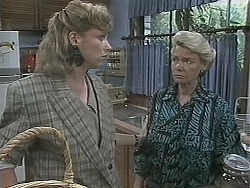 Bronwyn tells Sharon that her boss has sacked her - his daughter decided to leave school and now she's got Bronwyn's job. So Bronwyn is looking through the vacancies in the newspaper. She still wants to work for a vet. Melanie has finished the report and Paul apologises for yelling at her before. Melanie tells Paul that she was reading a book about social relationship at work and thinks they should get to know each other better so they can work better together. She invites Paul to dinner with her and Des tonight. She thinks it would be much better than a night in a lonely hotel room and Paul agrees. Helen tells Beverly that Paul must have found his anniversary with Gail hard to bear. Helen asks Beverly about their anniversary do and the necklace. Beverly doesn't know anything about the necklace and confesses that she and Jim had a fight about her being called away to a patient. Now he's behaving as if Beverly purposely sabotaged everything. Melanie is inviting Bronwyn to dinner tonight as Des can't make it - but Bronwyn and Sharon are going out. Bronwyn says Melanie will be able to cheer Paul up on her own. Melanie isn't convinced! Melissa has arrived and so has Josh. He is clearly delaying her from going in until Todd arrives. Finally, Todd runs up and Melissa is shocked to see him. Josh makes an excuse and runs off, leaving them together. TODD: Looks like we've been set up. 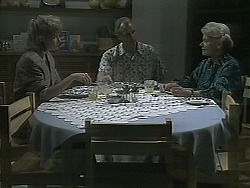 There is an icy silence of dinner with Jim, Beverly and Helen. Helen tells them that she's been given 6 tickets to a ball and suggests that they get a group together for it - it's on Thursday. Jim frostily tells her that Beverly will probably be working. Beverly starts shouting at Jim that she has responsibilities beyond office hours! Jim says there are also responsibilities to your family! Beverly storms off and Helen tells Jim to cool down, but he's not having any of it - he says Beverly is totally obsessed with work. Helen points out that Beverly is missing Rhys a lot, but Jim says that she's not giving the family any time. Helen begs Jim to make peace - maybe he could give Beverly her anniversary present. Paul arrives. She explains that Des and Bronwyn aren't available, so it's just them tonight. She awkwardly gets out some champagne glasses, but they soon get chatting about their living accommodations. Paul says he's fed up of being on call at Lassiter's. Melanie says he could get a house, but Paul think a house is lonely on your own. The film has finished and Melissa and Todd are getting on quite well. But they soon get back to arguing and Melissa tells Todd to rack off! Josh can't understand why Todd and Melissa have had yet another fight - he thinks they're both pig- headed. Melanie and Paul have enjoyed their meal and are getting on well after a few glasses of wine. Paul thanks Melanie for coming in on Saturdays, but warns her not to let business run her life - Gail always told him that. He starts saying how he was always too busy when Gail needed him, and now it's too late. Melanie says he can't blame himself for everything. Paul tells Melanie that he actually had a terrible day yesterday on his anniversary - he couldn't stop thinking about Gail and the triplets. Paul thanks Melanie for being such a good friend. Bronwyn tells Sharon that she's thinking about going back to school to finish Year 12 - then maybe she could go on to University and study to be a proper vet, rather than a vet's assistant. Or, maybe she'll go and join Henry in New Zealand. Sharon is horrified at the thought - she and Bronwyn have only just made up! Paul is waxing lyrical about what a good father Des is. He doesn't think he's cut out for fatherhood. They've both had a lot of wine. PAUL: All I ever wanted to be was a good dad. I just wanted to have a family, like my father. Now, there's another one, he's a good dad! I just wanted to have the chance to watch my children grow up. Now I won't get the chance...because I'm a dud. MELANIE: I don't think you're a dud. MELANIE: You've also got a lot of other good qualities. PAUL: Oh really, like what? MELANIE: You're also hard- working, thoughtful, kind and funny. MELANIE: Yeah, I think so! PAUL: You really think I'm funny?! MELANIE: Well, you make me laugh. PAUL: Do I? How come I'm so miserable? He starts to cry and Melanie comforts him, saying it's alright to have a cry. PAUL: I'm sorry, Mel. I never realised what a terrific girl you are, you know that? No, really, really. A lot of girls wouldn't take the time to care as much as you do. Thanks. Paul pulls her in closer and kisses her. Melanie kisses him back.